Clean. Naturally. Discover the miracle of ‘Pure Soap’ for beautifully natural skin, that puts new life into sluggish complexions and brings a natural healthy glow to the entire body. Cleansing the skin is the most important step in skin care. Pure Soap accelerates the skin's own cellular reproduction process by gently removing old cells, excess oil, suspended soil, pollutants, and makeup without stripping the skin so the skin's own natural, nurturing oils can repenetrate and replenish the cells for softer, smoother skin. It does what nature wants a soap to do. 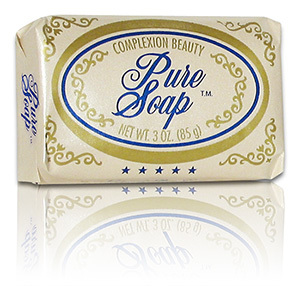 Pure Soap leaves no drying alkali residue on one's face and body after rinsing. It doesn't doctor your skin, it just cleans it safely and thoroughly. Pure Soap makes a difference in the way you feel from the inside out. 1. Contains the highest grade white vegetable tallow and pure cocoa butter oils for a velvety feel and luxurious lather. 2. Pure Soap does not contain any inert ingredients polluting phosphates - enzymes - salts - chemicals - artificial additives - coloring dyes - irritating allergy prone disinfectants - sticky deodorants - lanolins - useless creams - harmful perfumes - artificial detergents - and toxic antibacterial chemicals. 3. Individually compressed under extreme high pressure to create an extra hard bar. Pure Soap will give satisfaction down to the tiniest sliver of rich cleaning lather. 4. Each bar is wrapped and sealed for lasting freshness. For the longest life of each bar keep dry when not in use. There is nothing miraculous about Pure Soap, yet many people gladly pay $5.00 and more a cake for expensive European and cosmetic varieties of soap that don't have one-half the special qualities of Pure Soap. Families that use it for dry or sensitive skin find it equally helpful for oily and normal skin. Teenagers with problem skin use Pure Soap to help keep their complexion smooth, clean, and clear. Mothers choose its gentleness for baby's bath. Both men and women have discovered Pure Soap's lubricity and creaminess make it the ultimate shaving cream. Discover for yourself today the difference between washing your face with a harsh detergent, antibacterial agents or deodorant and 100% Pure Soap. discover also the miracle of old fashioned Pure Soap, the creamiest and most luxurious bar of soap in existence.